Specific gravity can be defined as the density of any substance to the density of other reference substance at a specified temperature. For example, to determine the specific gravity of cement will consider water as reference substance. In simple words, the specific gravity determines whether the material will sink or float in water. Every material has its own specific gravity and the value normally varies from 0.1 to 100. The material will float on water if the value is less than 1 and will sink if the value is greater than 1. Normally we use nominal mix design based on the specific gravity of cement as 3.14. But this value will change with time if the cement is exposed to the different climatic conditions (Due to moisture content). Therefore it is very important to know the specific gravity of cement before using it in the mix. As we said earlier, cement may contain excessive moisture content if it is exposed to the various weather conditions and we all know that w/c ratio is a big factor which determines the concrete strength. Because w/c ratio is directly proportional to the workability. If the cement contains a greater amount of moisture in it then the w/c ratio will definitely affect the workability as well as the strength of concrete. As per industry, the acceptable value of specific gravity of cement is up to 3.19. But if the value is greater than 3.19 it means cement is containing greater amount of moisture content which will affect the workability and strength of concrete. This is why we need to calculate the correct value of specific gravity of cement before using it in the mix. Aim: To find the specific gravity of cement. 2. 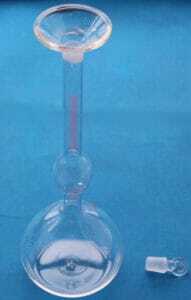 Specific gravity bottle / Le-Chatelier of 250 ml capacity / Pycnometer (100 ml). 4. Weighing machine with 0.1 gm accurate. 1. Measure the weight of empty flask (W1). The flask should be totally dry and free of liquid. 2. Fill half of the flask with cement (about 50 gm) and Measure the weight with its stopper (W2). 4. Now empty the flask and again fill it with kerosene up to the top of the flask. Weigh the flask (W4). where, Specific gravity of Kerosene = 0.79 g/cc. 2. The test should be done at 30° temperature. Also Read – How To Check Cement quality At Site.